Rocky Mountain National Park is home to the highest, longest paved road in the United States. Each time we drive over these 48 miles I am totally in awe. You can start your drive in Estes Park (where we usually do) or in Grand Lake as you climb to 12,183 feet. The scenery along the way is simply stunning. This is a two lane paved road that runs the whole 48 miles. It can be tricky, as bicyclists are also allowed to travel this route, which does not boast a lot of shoulder areas. There are several pull out areas along the course of the route and they each provide their own unique views. My advice is to stop at any pull outs or parking areas that are feasible, as the rapidly changing weather conditions can shorten your road trip on Trail Ridge Road. Make the most of your road trip. We made the hike to the top of a trail that was across from the Alpine Visitor Center. The views were phenomenal! The 48 miles on Trail Ridge Road is not open 365 days of the year. Old Man Winter determines when the road actually opens and when it actually closes. Lower portions of the road remain open, weather permitting. It wasn’t until 1932 that this two lane road was built. Before 1932, the only way to the top was to travel on Fall River Road. A fun way to see Trail Ridge Road is to start in Estes Park and enter through the Fall River Entrance Station of Rocky Mountain National Park. Shortly upon entering the park you will come to Fall River Road. Yes, it is a one way dirt road. The signs that are posted do matter, as they do give advice on what types of vehicles are not allowed. Once you arrive at the Alpine Visitor Center, it’s worth stopping to check it out. A gift shop and restaurant are also nearby. Keep in mind that it is a good idea to check on the hours of operation when you enter the park. We have arrived at the top and found the gift shop and visitor center closed. Weather and different times of the year can impact when the visitor center and shops close. The Alpine Visitor Center and gift shop are all closed when the upper parts of Trail Ridge Road are closed. No matter which path you take to travel from Estes Park to Grand Lake, you can be assured that you will have an enjoyable adventure. 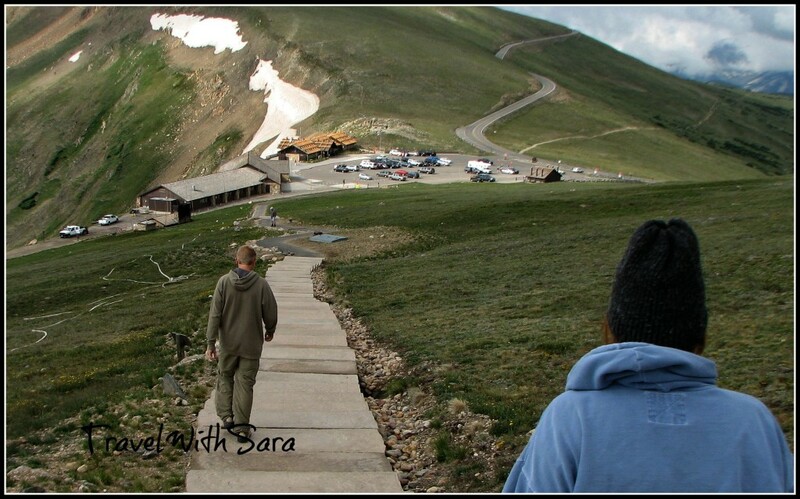 Pack a picnic lunch, as there are several beautiful places to have a picnic in Rocky Mountain National Park while driving on Trail Ridge Road. Come, take a ride on Trail Ridge Road with us! We think you will we glad you did. A couple tips on driving Trail Ridge Road. If you have anyone that tends to get car sick, be sure they sit in the front seat and maybe take some motion sickness medication before you begin the drive. It’s also a good idea to get acclimated to the area before you make the drive. If you can stay in Estes Park or Grand Lake for at least 24 hours before making the drive, you will have less chances of experiencing altitude sickness. I need to add one more tip. Be sure you have packed winter hats, gloves, and sweatshirts/coats, as it is a lot cooler on the top of the mountaintops. And how do I know this? We have experienced all of the above in the 20+ years that we have been visiting Rocky Mountain National Park. Visit Rocky Mountain National Park soon! 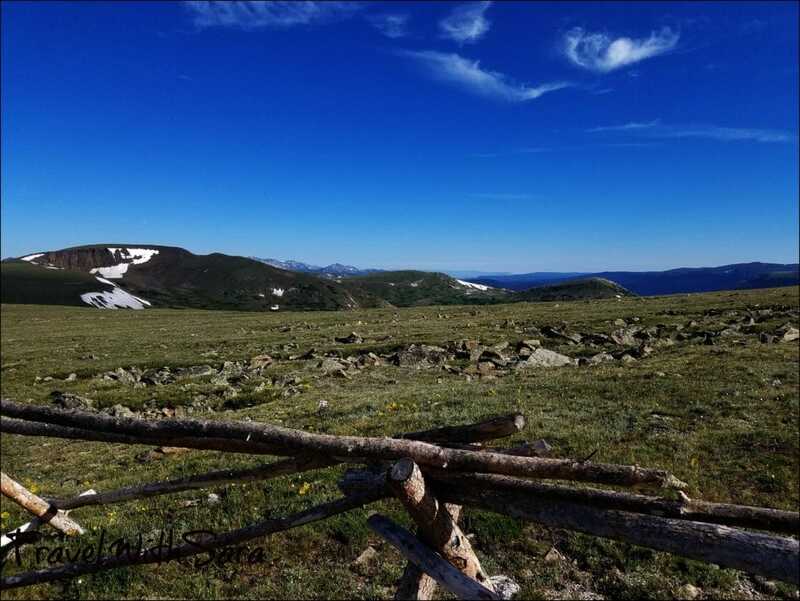 You will be glad you did, and trust me; you will be planning your next vacation to this park before you even get to the highest point on Trail Ridge Road. 7 Responses to "Trail Ridge Road: Scenic Drive In Rocky Mountain National Park"
I have not biked it, but after my visit a couple weeks ago, I found a company that does biking tours on the way down. This looked appealing to me and the people riding loved it. I’ve been to Colorado, but not to Rocky Mountain National Park. That drive sounds (and looks amazing), though I can’t imagine biking up a road like that. Due to medical conditions I can’t go above 1500 metres for long periods of time, so I don’t think I would be able to go on this road but I certainly am jealous of that fact. It looks simply stunning. Pity about the height. Sure can ~ I see it done all the time! Wow the highest, longest paved road in the United States seems so templating with spectacular view. I bet we should do it tough with cycling up to the highest point on Trail Ridge Road. Do you think we cyclists can make it within a day? The Trail Ridge road looks mesmerizing.A real slice of the beautiful outdoors.. The mountain ranges look majestic and I am sure trekking or driving here is an unforgettable experience. The tip about altitude sickness is very practical and something one needs to keep in mind.